Need more information about booking Home 9227610 ? 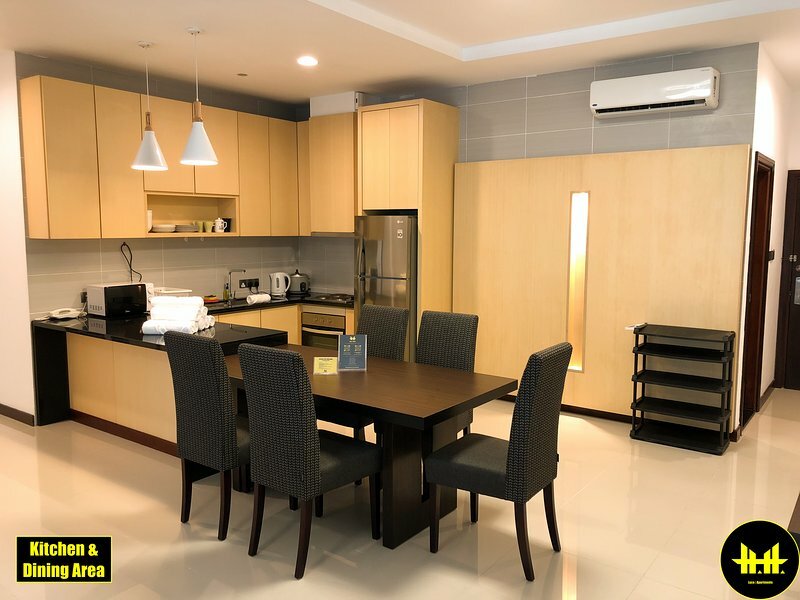 Luco | Apartments at Imperial Hotel Kuching is located in the same building as Imperial Hotel. Our serviced apartments sits above the Boulevard Shopping Centre. Facilities such as the gym, swimming pool, sauna and steam room are situated on the sixth floor of the same building. Each apartment unit comes with a kitchen, living room, dining area and a paid laundry area equipped with a washer and dryer. All of our apartments come equipped with high speed wireless internet a.k.a WiFi and cable television. Extra amenities such as the hairdryer, ironing facilities, toiletries and towels are provided to all of our in-house guests. Our Guests Relations Manager (GRM), Andy H.H. Lau, is in charge of serving our customers when they stay at Luco | Apartments, Imperial Hotel, Kuching. Anytime before, during and after your stay, Andy will try his best to cater to your needs. Guests will be able to meet our GRM during check-in for key collection and during check-out to return the apartment keys. You can get in touch with Luco (the owner) through the contact form on this page. Send Luco (the owner) an email through the contact form on this page. Alternatively, if there’s a phone number on this page, you can call them. How do I contact Luco (the owner)? If you’ve already booked, go to Manage your holiday booking to view Luco the owner's contact details or send them a message. Or send Luco (the owner) an enquiry through the Contact the owner/manager form if you’d like a quote or more info first. When you pay online through the Book your stay form, a booking request is sent to Luco (the owner). You’ll find out within 24 hours whether they’ve accepted - no money will leave your account before then. You can also request a quote from Luco (the owner) through the contact form. The owner will email you the total cost for your dates and a link to book and pay online. Use the Book your stay form to pay provisionally online. You can pay by credit/debit card or PayPal. Luco (the owner) will have 24 hours to accept the booking and no money will leave your account before then. Why can't I call Luco (the owner) before booking? You’ll need to contact Luco (the owner) to do this. Send them a message in Manage your holiday booking or through the contact form on this page. You can request to change the dates or number of people on your booking via the Manage your holiday booking page. To change your holiday dates use the Edit booking button. If you need to change the number of guests staying then send Luco (the owner) a message. If Luco (the owner) agrees, they’ll send you a revised quote outlining the changes. You can review and accept/decline this from the Manage your holiday booking page. You’ll have 48 hours to take action before the revised quote expires.